Fresh crabmeat patties are coated with cracker crumbs, browned in oil and served with tangy mustard sauce for a superb seafood entree. Mix crabmeat, peppers, onions, eggs, pepper sauce and 1/2 cup cracker crumbs. Refrigerate 1 hour or until firm. Meanwhile, refrigerate combined dressing and mustard. Shape crab mixture into 10 (1-inch-thick) patties; coat with remaining crumbs. Heat oil in large skillet on medium heat. Add crab cakes, in batches; cook 3 to 5 min. on each side or until golden brown on both sides. Drain on paper towels. Serve with mustard mixture. 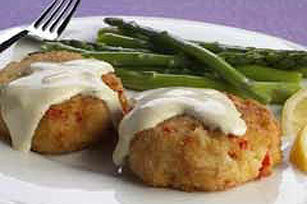 Serve these tasty crab cakes with your favorite hot steamed vegetable. To easily crush crackers into crumbs, process the crackers with blender or food processor. Or, place the crackers in resealable plastic bag and crush with rolling pin.